PETERSBURG VA. The new robotic system PolySHAPE developed by Polytec Robotics is engineered and developed to have a dimensional scan of the billet, bloom, beam blank and slab surface, in order to identify a range of dimensional and cutting defects. Specific algorithms concatenate few scans of the part, elaborate this information acquired and generate a 3D model of the part, then the software can extrapolate few sections and calculate the average for a stable and reliable measure. The system is engineered to work in the harsh environment of the Continuous Casting Machine. PolySHAPE is equipped with a specific 3D machine vision sensor able to acquire precise profiles on hot metals, synchronize with the robot position generate a 3D precise images of the product. The cell has also a thermal camera included in the head to refer to each 3D point also a thermal value, this result is used to compare the real dimensions with the theoretical one at the real temperature, is also useful for check the cooling homogeneity and find the correlations between defects and inhomogeneity. 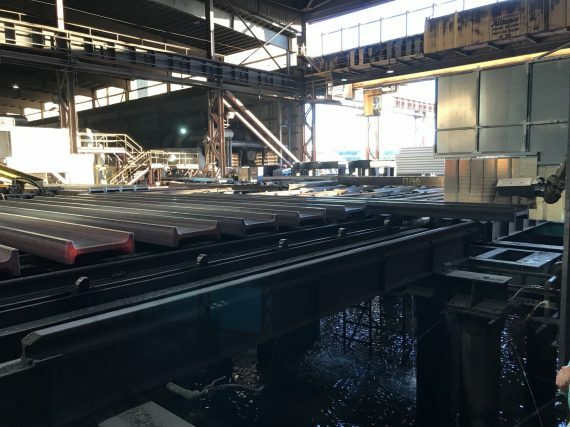 The inline analysis on each billet, bloom, beam blank, slab increases the safety of the operators, reduces the quantity of scrap, helps to identify the correlation of the production parameters and the defects during the operations and have an immediate feedback about the strand where the defect is located.